A new day, a new review! Let’s see what a program called Stradivarius can offer us in terms of potential benefits. Stradivarius joined the Golden Stage on DavidNews.com monitor on January 14, 2018, and has been online for 21 days in total. I just realized it reminds me of the program In Vinom Veritas, which was related to the vine and had this classical style appeal. Most likely it’s a coincidence but still, both of them stand out from the crowd during the time of crypto-madness. I have reinvested in Stradivarius $400 to keep you updated on the payment status of the program. Keep reading to find out what are the financial benefits this program and what can it offer to us! 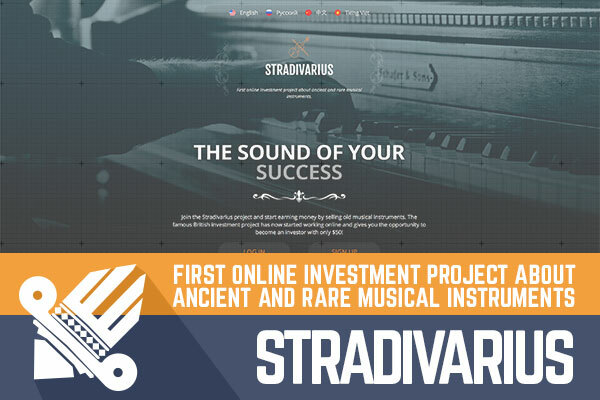 Briefly, this is another program offering quite a few investment plans, giving the impression that there are many options to choose from... Stradivarius offers 8 investment plans. All of them can be divided into two categories – “after” and “for”. The minimum deposit for all plans is $50, the maximum $9999. As simple as it is - the higher amount of deposit invested the higher % investors get back on expiry. “After” stands for – after a certain amount of time. Initial deposit and daily accruals are returned at the end of the investment term. There is no way to withdraw money earlier than investment term of the chosen plan – “after 1 week”, “after 2 weeks”, “after 3 weeks” and “after 4 weeks”. The interest rate for “after plans” vary from 105% to 200%. The second group of plans – “for”, which are available for the similar period – 1, 2, 3 and weeks, but the difference here is that initial deposit is included in payments and accruals can be withdrawn daily. In other words, extra safety for your investment if you remember to request withdrawals enough often. Interest rate varies from 103% to 190%. The minimal withdraw amount is $1, but for bitcoins - $25.00. Withdrawals are processed instantly, however, on the website, it is stated that withdrawals in bitcoins can take some time. Stradivarius accepts the following payment options - PerfectMoney, Bitcoin, Payeer, AdvCash. Feel free to visit the website of the program to find more information about investment plans yourself! From time to time we find a few programs without bitcoin-related legends. Stradivarius is a HYIP with an uncommon legend. As you probably guessed the program is related to musical instruments. As stated on the website: ”Stradivarius Investments Ltd is a British company, which business is ancient musical instruments. The company's business consists in the purchasing and further selling of ancient, historical musical instruments, as well as those that have cultural and ethnic value. Stradivarius cooperates with famous auction houses, such as Christie's, Sotheby's, Bonhams, Dorotheum, and others”. Sounds great, but sure no one knows what’s their main area of activity is. I’m glad that there are some creative admins that make slightly different legends in the era of crypto madness when even grandfathers and grandmothers consider purchasing some cryptocurrencies. Of course, it’s a fresh breeze and is interesting to read what topics/ideas program admins have chosen to make money from or at least write a HYIP legend about. Moreover, people in HYIP forums are happy to see such legend and a new approach how to raise money in the HYIP world. Anyhow it doesn’t mean that Stradivarius is here to make a profit for us. Nothing personal, just marketing to raise more money… Paying status has nothing to do with it. When it comes to the website, I have to say that copywriter has done a good job writing few good marketing slogans. “The sound of your success”, “Stradivarius - the most beautiful investments!” I don’t see often such poetic copywriting elements in HYIP content. Yes, of course, it is luscious and probably not the most suitable approach for the HYIP community. But the slogans and the unusual legend makes me remember the program! The website itself is quite simple – home page and two additional layouts (popups) for FAQ and contact us page. It lacks an investment calculator; therefore you need to do your own calculations. Overall - a standard layout, a few pictures and the most important the website offers very little information about the program. The website is available in English, Russian, Chinese and Vietnamese. It has an SSL certificate from COMODO RSA and it is valid: until September 29, 2018. You can also find an image of the registration certificate. It seems that lately many HYIP admins have chosen a similar pattern – a simple template and to provide as little information as possible. Another trend which is followed by Stradivarius admins - avoid social media activities. In fact, it’s not a bad idea because I doubt that most of the social media followers of any program are real. In the meanwhile, we can see that admin is actively trying to promote the program in the HYIP community using a variety of other channels – monitors, written reviews etc. Stradivarius has 8 investment plans, but I recommend looking only at the most realistic ones. I’m sure I will avoid the 4th plan called “After 4 weeks” because we all know that 4 weeks is a long time in a HIYP world. A deposit of $200 would make a net profit of $10 in the “After 1 week” and $50 “After 2 weeks” investment programs. The downside of these plans is that in case the program stops paying investor will lose all money. While in “for 1 week” plans investor can request withdrawals daily. However, the profit for these plans is even lower. So, “after” plans have a higher interest rate but are riskier. We are looking at a program offering short-term and mid-term investment plans with interest rate, which is increasing in case of larger deposits and longer investment terms. I don’t find this program beneficial for small investments because interest rates are too low. Of course, it’s easier to pay interest rates for investors with such rates. However, I believe that HYIP investors are not here to make a few dollars. I’m closing this review like any other reviews with a reminder that there is no HYIP in the world we can predict. Therefore, if you ever decide to make any investments, don’t invest more than you can afford to lose! Have you already made an investment in Stradivarius and have anything worth sharing? Please drop a message in the chat box to share your experience! Investment plans: 105% up to 113% after 1 week, initial deposit included in the payment. 125% up to 140% after 1 week, initial deposit included in the payment. Ignore other investment plans.